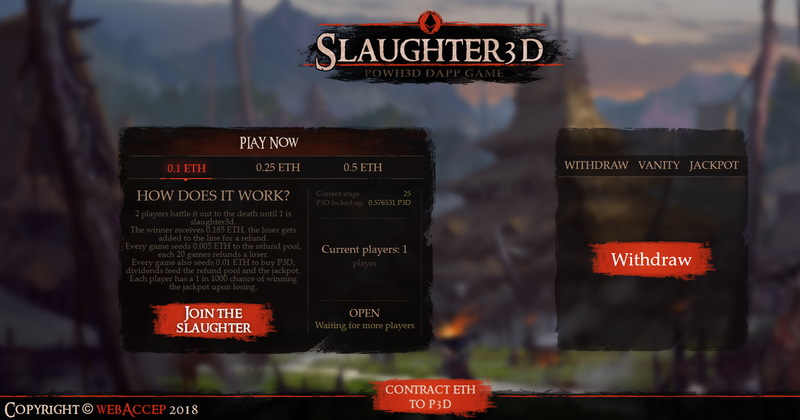 2 players battle it out to the death until 1 is slaughter3d. The winner receives 0.185 ETH, the loser gets added to the line for a refund. Every game seeds 0.005 ETH to the refund pool, each 20 games refunds a loser. Every game also seeds 0.01 ETH to buy P3D, dividends feed the refund pool and the jackpot. Each player has a 1 in 1000 chance of winning the jackpot upon losing.